Description One-bedroom unit converted to two bedrooms. Recently Completely Renovated! Available 01-15-19 or 02-01-19. You will love this great space in the second floor South Building of the Claridge House in Foggy Bottom. 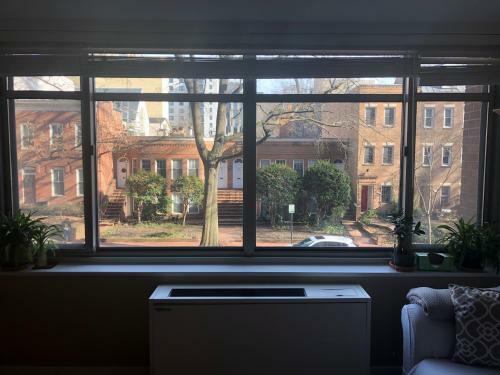 Close to Foggy Bottom metro, Dupont Circle, Georgetown, George Washington University, restaurants, bars, Whole Foods, Trader Joes, Rent Includes all utilities, Cable available. Rooftop Pool and Fitness Center, deck with grills. This space designed with high-end folding frosted panels on a track, that can be used for complete privacy for 2nd bedroom, or the panels can be retracted to make 2nd bedroom a living room/guest room. Possible occupancy for single, couple, or two roommates. Assigned convenient parking available for $180/mo. This Co-op unit was gutted and 100% Renovated- All new high end designer materials. New Hardwood flooring, all new kitchen w granite breakfast bar, all new high end appliances, all new tile and beautiful shower. New lighting, new closets, the list goes on and on. 2nd Floor Unit. Interior shots show beautiful views. Living Room/Bedroom #1 has great east view of 25th street Georgetown-style townhouses across the street. Bedroom #2 has beautiful west private view of courtyard. First, Last, Security, 19 or 20 month lease through June 1, 2020 preferred. No smoking or pets, Credit Check Please Respond to me via email providing brief background and your employment status. Thank you.